This recipe uses pre-made manicotti, meatballs, and spaghetti sauces, but it is dressed up into something special. Saute onions and mushrooms in olive oil. Add sauces, spices, and meatballs. Cook until meatballs are hot. 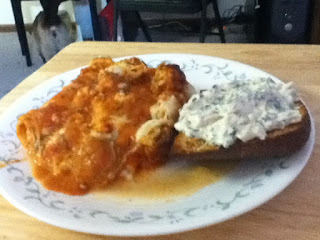 Put a layer of sauce in 9x13 baking dish, add manicotti, cover with remaining sauce. layer cheese on top. bake at 350 degrees for 30 minutes. yummm....I love manicotti, this sounds great! Looks yummy! Thank you also for the kind comment on my strawberry slippers. I appreciate it! FYI-you will want to change your blogger profile to show your email address. That way fellow bloggers can reply back to your sweet comments! Right now you show up as a no-reply blogger. Oh man, this looks amazing. Yummy pasta goodness, mmmmmmmm. I would be honored if you would share it on my Recipe of the Week #2 PASTA post! There will be a gift card giveaway ;) Hope you come join in the fun! If you have any other pastas you would like to share, please add those too! Perhaps you need to reinstall the pin it button - I did do a post about it on Carole's Chatter Blog tips that you might find helpful if you can't remember how to do it.